Click to call us now! 4. Power supply :1x18650/ 16340 Li-ion Battery. 12. Preheat time: &lt; 3seconds. 13. Working temperature: +15℃ to +35℃. 14. Storage temperature: -10℃ to +40℃. 16. Spot size:6M place &lt;&phi;10mm. 1. It is used to point at any desired target on projection screen, video, etc. 2. It can be used for presentation, teaching indicator, etc. 3. Across the sky, leading you to find the stars in the clear nights. 4. Lightweight, suitable for putting in your pocket or handbags, easy and convenient to bring. 5. This high quality laser pointer adopts the latest technology optics and microelectronics. 6. Press-button switch at the bottom, no need to keep holding when use it. 7. 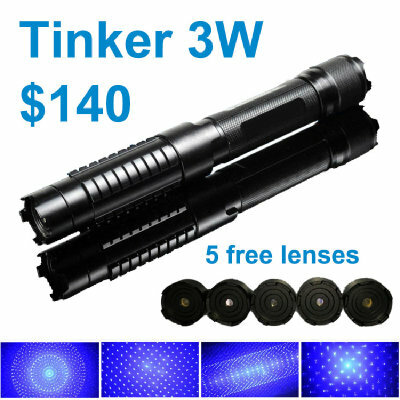 Designed with green color light, which is easier for you to find the target and outlight the key point. 8. Designed with a hang rope, convenient to bring and you don't need to worry about losing it. 9. The copper at the end is fixed by aluminium sheet, which avoids short-ciruit. 10. Power-saving: with a key to lock the laser to avoid power loss -- when the key points at the red point ~ lock (green point~unlock). 11. The handle is made of anti-slip material, which prevents the laser pointer pen from dropping down. 12. Designed with a waterproof sealed ring at the end, which keeps water from running into it. 1. Avoid direct eye exposure to laser beam -- exposure to the eye can cause permanent damage. 2. The laser is bright even in normal temperatures and daylight, so it is recommended to limit it to 30 seconds or less per use to avoid heat buildup. 3. Please keep this out of the reach of children. Any ideas or questions? Discuss, ask, and answer here publicly. The Q&A will benefit all visitors, and in return every one can help, not only LasersPen.com agents. If you want to keep your questions private, use the live chat or email. Huge Selection of Laser Pointers! Laser pens, laser pointers, high powered burning lasers, and stage laser lights. Subscribe to our newsletter and get up to $200 off your order!! Copyright © 2019 LsersPen.com. All rights reserved. ship to " + "" + json.city +", "+ json.region + ", "+ json.country +".